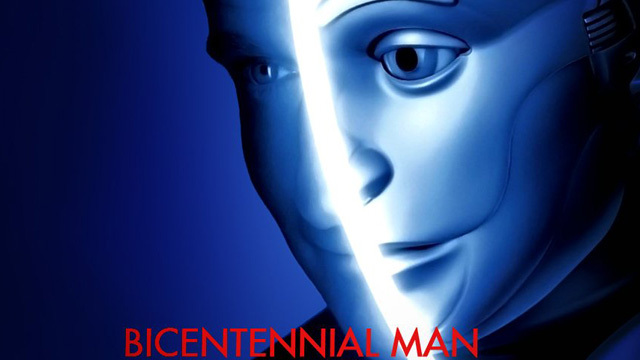 Bicentennial Man – The Anti-Frankenstein | Warped Factor - Words in the Key of Geek. Tony plans to live forever – or die trying. With Westworld rising from the electronic grave, and Humans coming back for a second bite of the digital cherry, it’s time to talk about one of the least successful – but arguably most positive – stories of transcendence from robot to human consciousness. Robin Williams was often accused (most notably by famed British film critic Barry Norman), of making two kinds of movies – the kind that were hard to watch but thoroughly worthwhile, and the kind that were more or less sentimental slush. 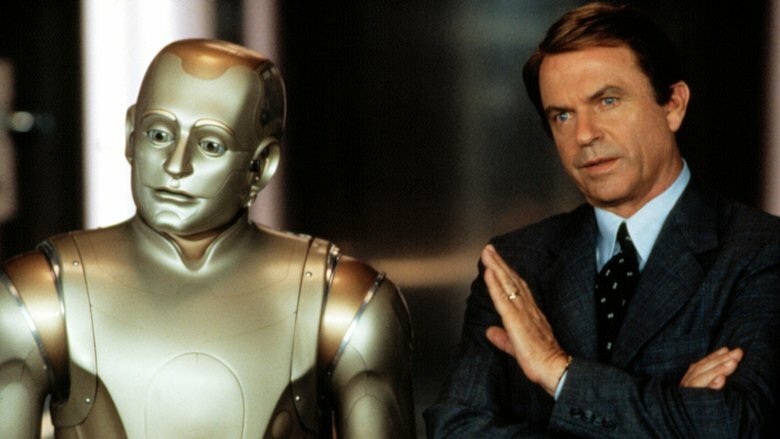 That’s a little hard on a man who worked to bring joy to audiences, sometimes in gritty, realistic ways and sometimes in more over-the-top creative ways, but certainly when it was launched, Bicentennial Man was quickly lambasted as one of those more sentimental movies and became one of Williams’ lesser known and less-favoured movies. He even joked on his last major stand-up tour that ‘Bicentennial Man was good for nobody,’ reviving a gag he originally used to accept criticism of his earlier flop as Popeye. But there are parallels between the movie and the original Frankenstein that make it worth re-evaluating in these sanity-challenged days. In Mary Shelley’s novel, Victor Frankenstein drives himself to the point of sickness, if not madness, studying biology and investigating the fundamental spark of life, till he re-animates a creature sewn together from human cadavers. As soon as he realises what he’s done though, he runs away, abandoning his unnatural ‘offspring’ to find out about the world, human beings and itself on its own. Initially the creature is childlike, staying away from humans and revelling in nature. When he does venture near humanity, he’s met with hostility and violence. Then a blind man offers him sanctuary, solace, learning and books, and the creature begins to appreciate both what is good and what is evil in humanity. Despite his misgivings, he’s persuaded to let the blind man introduce him to his family – with catastrophic results. Meeting nothing but contempt from his ‘father’ when he finds him, the creature learns that to be human is to be vengeful, to be spiteful, to destroy what one does not understand. He reasons that another like him, a partner, a wife in fact, would balance the potential of good and evil in him, and Frankenstein, under sufferance, builds him his bride, only to destroy it in front of him, arguably for the safety of humanity, but equally arguably for nothing but spite and vengeance for the threats the creature has used to get him to comply with his dearest wish. Incensed, the creature goes out for blood, to punish Frankenstein for his parental unkindness, destroying members of the Frankenstein family, including the cousin who is the cruel doctor’s new bride. To borrow from an older literary source, he invokes the Shakespearean idea of ‘being even with him, wife for wife.’ And the novel ends with the two of them, father and son, creator and created, tormenting each other with their continued existence, trekking to the ends of the earth, to a never-achieved exhaustion and death. It’s a laugh a minute, clearly. What it is though is a book that can be read as a polemic warning to accept others – if you’ve deliberately created something, look after it, welcome it, and above all, teach it to be a force for good. Likewise, if people come among you who are entirely different, treat them kindly, not with fear and loathing. Frankenstein is a tragedy not really of gothic horror – the evil is only nominally in the hands of the creature – but of human failings. The lessons that the humans teach the creature are the lessons of fear, hatred and vengeance, and the creature, for all its eventual eloquence, judges it only right and fair to repay those emotions and actions in kind. 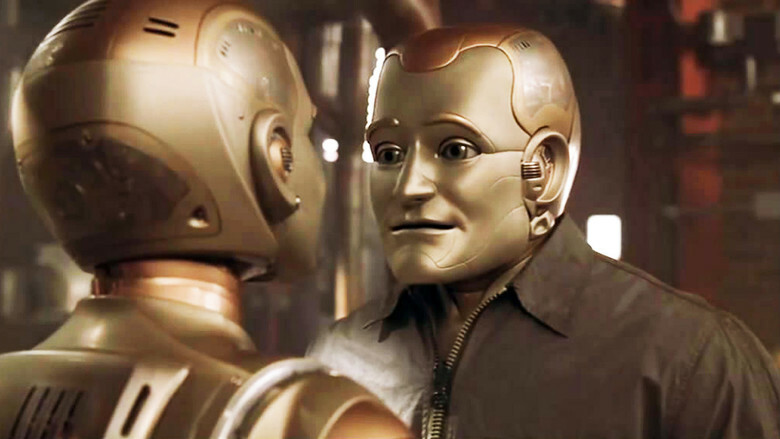 Bicentennial Man – itself of course a retelling not of Frankenstein, but of Asimov’s Positronic Man – exchanges hand-sewn cadavers for mass-produced robots, and makes the power through which Williams’ ‘Andrew’ gains his sentience a mystery, but essentially, it re-runs the same sequence of events – without the figure of paternal rage and abandonment on which to fixate though, Andrew’s first understanding of humanity is a loving human family, albeit one in which he ranks somewhere between a servant and a pet. The head of the household, Sam Neill’s Richard Martin, encourages Andrew to expand his mind – his programming – to aspire to greater humanity, but when that greater humanity culminates in a request to be set free of his domestic servitude, Richard banishes him completely, insisting that freedom must be absolute. Meeting a sympathetic robot developer (Oliver Platt, playing Rupert Burns, the son of the creator of the class of android to which Andrew belongs), Andrew begins working with him to develop systems that refine both his physical humanity and his ability to express human emotions, and the notion of a creative android is explored to its full potential – bringing a combination of an increasing understanding of humanity’s organic problems, coupled with an android efficiency in terms of problem-solving, he is able to deliver solutions that neither humans nor androids could devise alone, curing diseases and prolonging human life. It’s by no means all plain sailing, and this may be where Bicentennial Man’s bad rap is least deserved. Andrew faces prejudice and ridicule at every turn, as well as a company that sees him as an asset, their asset, and wants either to control or eradicate him, to claim his creations as their own. Even when he embarks – not as an experiment but as an emotional reaction – on the impossible adventure that is loving someone who can’t see him as human, he’s viewed as an outsider, a thing, he’s turned away from society because society refuses to validate his existence. Granted, it’s less about Frankenstein’s torches and pitchforks in this scenario, but humanity has a long history of being stupid about equality and the parallels are there: the African slave trade was predicated on seeing black people as a lower class of human being; women were prevented from having the vote on the basis of a sense of justified inequality; gay people are still (believe it or not) fighting for their social equality; trans people are next to step into the battle for treatment that validates their existence as an equal with those in the majority in society. Even as we speak, one candidate for the US Presidency is calling Mexicans names and planning to build a wall, and the Home Secretary of Great Britain is talking about forcing businesses to list their native-born workers and their foreign-born ones. Equality is clearly the most obvious fact to be strenuously ignored by human beings in history. So Andrew works, and talks, works and talks, continually jumping through a series of ever-changing hoops laid down by people before they can grant him membership to the seemingly simplest club on the planet – humanity. He even chooses to deteriorate, to grow old and die, to give up his robotic immortality for the chance to legally transition to the state in which he patently exists – the state of humanity. He makes a series of colossal sacrifices simply for the right to be acknowledged as a human being. And finally, simply by the process of time and persistence, humanity gets as smart about his nature as he’s been for over a century, and ‘grants’ him his inclusion in the species. Time will do that, and time usually has to, because human beings are still stuck in the Frankenstein loop of fear and loathing of what they don’t understand. The passing of centuries just allows us to grow our societal understanding about one case, then the next. Then the next. Frankenstein is a tragedy of human nature, that we teach those we don’t understand only fear and loathing, that we refuse to acknowledge them for what they are, our brothers and sisters on a small blue-green planet, trying to get by without messing up too badly. 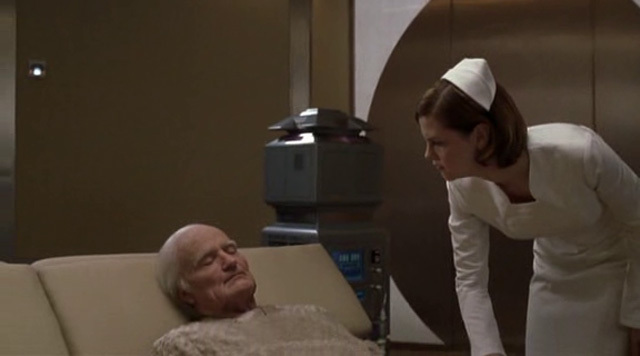 Bicentennial Man takes the premise of Frankenstein and imagines a creature who, when faced with the short-sightedness of human beings, does not repay an eye for an eye and a tooth for a tooth, but takes the failings of Mankind as a challenge to be a better human himself. One who meets hostility with humility, who meets isolation (and occasionally, chirpiness) with humour (and occasionally a drill), and one who sets themselves the target of living as well, as productively and creatively as possible, for however long life lasts, and then dying with love, with friendship and with dignity. It takes the potential of Frankenstein’s creature, and lets it learn not rage, not violence, but self-determination, generosity and hope that change will come. That may be sentimental tosh to large swathes of the movie-going audience. Or it may just be a lodestone to help us get over the fear and loathing of others, and find the better humans we can be.